Stopa: As you said, these conditions are really quite different from what was originally the focus of public health, and so I wonder what your thoughts are regarding the adaptability of health systems. A lot of the health care systems in lower income countries have focused on communicable diseases. Do you think that health infrastructure will be able to adapt to these new challenges? And do you think enough foresight has been invested in planning that it will enable transition to this new focus? 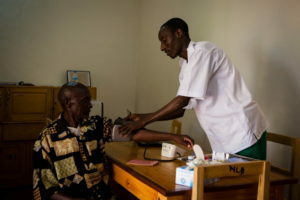 RWINKWAVU, RWANDA – FEBRUARY 13, 2015: Nurse Olivier Bigirumwami checks on a patient at the NCD clinic at Rwinkwavu District Hospital. Gupta: That type of health system strengthening is exactly the focus of my work. In the low-income countries where my DGHE colleagues and I work, NCDs are less attributable to each person’s lifestyle choices, and more due to risk factors associated with poverty. Populations may be exposed to environmental risk factors, like occupational chemicals or toxins in the environment. They may also develop chronic diseases caused by untreated infectious diseases. That could include something like cervical cancer, which starts with the HPV infection and then leads to cancer when left untreated. Or with liver cancer, which starts with hepatitis B and C, and then leads to liver cancer or cirrhosis when left untreated. Or cardiac conditions like rheumatic heart disease that derives from untreated throat infections. I’ve seen that populations in low-income countries are not only suffering from NCDs that are probably driven by poverty, but they have less ability to access health services, and the health systems in their countries have less services to offer. This is the case in places like sub-Saharan Africa, South Asia and Haiti. We’re working with 11 countries in these regions to think about how their health systems can address some of these NCDs. The biggest risk factors are those relating to poverty and the health system being unprepared to diagnose and treat these diseases. To give you a sense of what we’ve done, through Partners In Health we were able to initially to set up clinics for NCDs in very rural areas of Rwanda. Those NCD clinics have now seen over 4000 patients, providing care in very rural areas. We’ve defined a package of infrastructure, equipment, medications, training, guidelines, monitoring and evaluation systems, IT platforms, and all the things that are needed to successfully address those conditions. We were able to support the Ministry of Health of Rwanda to scale up those clinics at every hospital across Rwanda, and we’re taking that example to other countries now, through the Partners in Health network. Stopa: I wonder about the resource capacity to scale up centers and access to care. Are healthcare systems in resource-limited rural settings being scaled up to the point of being able to treat cancer or other complex diseases? What’s the most difficult NCD for you to equip health centers to handle? 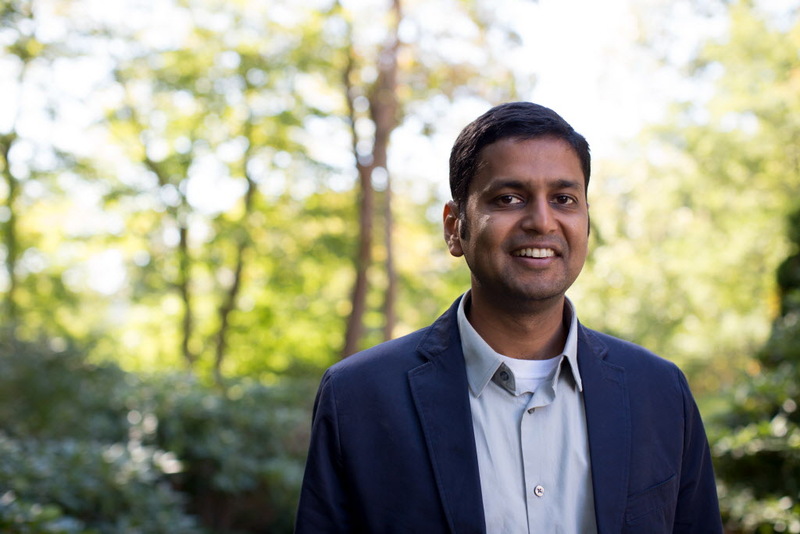 Gupta: What we’re finding is that with very basic platforms and task-shifting responsibilities to generalists and nurses, we’re able to detect and treat a number of cancers. So, I think cancer is very much within the realm of possibilities. We may not be talking about cancers that are most difficult to diagnosis and treat in the US like, for instance, small cell lung cancers or neuroblastomas that we would routinely treat at BWH. But the cancers that are impacting the largest portion of the population, such as breast and cervical cancer, or pediatric leukemias and lymphomas, are treatable in these systems. Some of the areas that have been challenging include surgical subspecialties, such as cardiac surgery. For example, with advanced valvular heart disease or congenital heart diseases, the cardiac surgery needed for those patients is still being done mostly by outside teams, such as Team Heart from BWH. And they do an excellent job, but we would like to build up that capacity within-country as well. We see those same limitations in other areas, such as dialysis services, insulin therapy for type-1 diabetes, and newborn screening for sickle cell disease. Those are some of the areas where we’ve been challenged by the limitations of the health systems in low-income countries. But I think this is the next frontier that we’ll be able to address. Stopa: I want to take a step back and look at what you mentioned regarding poverty being more of a risk factor than behavioral choices. In order to comprehensively address NCDs in low-income countries, you really need to address poverty. That involves getting a lot of different players involved, including the non-medical and non-clinical stakeholders. Who are your partners and allies in the communities where you work? Whose buy-in do you need for your programs to be successful? Gupta: In terms of poverty as a risk factor, most ministries of health in low-income countries are putting together what they call “multi-sectoral responses” to NCDs. And that’s where, at the national level, ministries of health have recognized that they can do only so much through the health system itself. They can get the health system ready, they can stock shelves with medications, they can put equipment together, they can train up staff. But if poverty is really the driving factor then we’re going to need influence from high level officials and from partners in other sectors. From the finance community, we need investment, development, job creation, poverty alleviation, social protection, housing, and public utilities. From the education sector, we need to get more mothers through primary school or secondary school because that’s one of the strongest drivers of poverty reduction within households and communities. All of those large-scale factors are important to what we’re trying to do in improving health indicators. There’s a domino effect. In places like Rwanda or Ethiopia, they’ve seen significant economic growth over the past 20 years. That economic growth, along with strong leadership and governance, have led to dramatic improvements in health indicators in those countries. In fact, they have seen some of the steepest health indicator improvements in history3. Then if we look at this from a community level, we can take community health workers (CHWs) as an example. CHWs have helped address chronic diseases and NCDs in many places. Our patients with rheumatic heart disease can benefit from a CHW visiting them in their home, diagnosing their illness, checking for the disease in other family members, linking them to care, helping them to adhere to a treatment regimen, and following them after a procedure. This can really contribute to a patient’s potential to live a long and healthy life. So yes there are stakeholders whose support we need at both the country level and the community level, in order to be successful in managing chronic diseases. Stopa: For you, your whole career revolves around the problem of NCDs, but do you think there’s enough attention being paid on the global scale to the burden of NCDs? Or do you think it’s not really on the global radar? Gupta: I think if you compare the attention paid to the global burden of disease, it doesn’t line up. If we look at your statistic from earlier about 70% of deaths worldwide being caused by NCDs, and then compare that to the level of funding in low-income countries, it’s really not proportional. The funding for NCDs is a tiny fraction of overall development assistance for health (DAH), nowhere near where it should be based on the global morbidity and mortality for NCDs. So, I think it’s a vastly underfunded area of global health. I would add that in many circumstances it’s difficult to parse out which funds are going to NCDs versus other disease areas, because the funds are often earmarked for health system development in general, which is a good thing. But it is clear that NCDs are an underfunded and under-resourced area. That is what led to the Lancet Commission on Reframing NCDs and Injuries for the Poorest Billion4. We wanted to focus on low-income and low-middle-income countries because in these countries, NCDs and injuries are some of the most severely under-resourced areas. Stopa: If we’re looking at the big picture, what are your long-term goals? What do you reasonably expect to achieve in your career? How much of the burden of NCDs can we alleviate in our lifetime? Gupta: What we’re doing with these 11 countries is putting together data to support national planning for the next 10 to 15 years. Within that time, if countries are able to invest or raise a significant amount of funding for the chronic diseases that are affecting the poor, then I think we can make really dramatic changes in access to healthcare, life expectancy, and health outcomes. I don’t think it even has to take my entire career to see those changes. I think that within 10 to 15 years, we will be approaching NCDs in a very different way. By that time I would hope that the category of NCDs would be broken down, so that we don’t talk about communicable versus noncommunicable diseases. These will all be conditions that are recognized, screened, diagnosed, and treated with high quality, in routine health systems at a reasonable cost. This is the vision of what is being referred to as universal healthcare (UHC). The idea of UHC is that if you can put together a comprehensive package of cost-effective interventions within the health sector and ensure that populations can access those services, you can alleviate both the health burden and impoverishment related to disease. We find that many people in the countries where we work are forced to sell their assets, such as their sheep or their house, just to pay for a child’s health care. If we can establish systems of UHC, we can address both communicable and non-communicable diseases on a single platform with fairly simple interventions. Of course, we need private sector development and input, but I think that by 2030 the landscape in which we’re working is going to look really different. Stopa: That’s really encouraging. I think there are a lot of people who view global health as impossible to address beyond crisis response, but I find it hopeful to hear that you believe we can see that kind of progress in that relatively short timeframe. I’d like to finish with a question for our readers, which is what can they do? How can our readers support your work in this global health care revolution, whether they are public health professionals or not? Gupta: Yes, that would be great! Readers can learn more about the work that we’re doing by looking at our websites5-9, and can also get involved in some policy initiatives. This coming year will bring some major policy events, like the World Health Assembly (where NCDs will be highlighted) and the Third United Nations High-Level Meeting on NCDs. We hope that readers will also look out for the Lancet NCDI Poverty Commission report, which due out in 2018. For clinicians and public health practitioners, there are many opportunities to get involved directly with NCDs. They can do training in their area of expertise, assist with guideline development, or even make clinically-oriented trips. If people within BWH are looking to get involved, they can reach out to the Division of Global Health Equity or to our team directly.